A simple macramé kit to create a chunky knotted pot holder in a choice of white and cream. Macramé is on the up…and so are your plants! 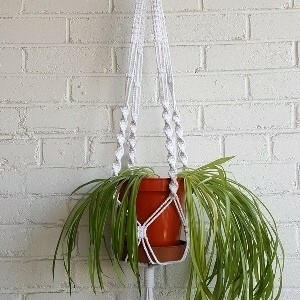 No longer seen as a 1970’s has-been or just for hippies and spider plants, macramé is cool again. More modern and stronger cords than once were available mean that macramé can be much more colourful than in the past, or choose a neutral or natural shade for a rustic effect. 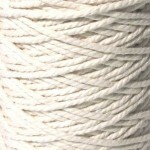 My illustration shows the bleached optic white cord with the cream being a more neutral undyed ecru shade. Both of these colours can be dyed either before or after knotting – dip the base tassel into dye and let it bleed upwards for a contemporary look. *Plastic Free Packaging* An order for one single kit (without a gift bag) will now be presented in plastic free packaging. This is a sturdy cardboard box that will fit through your letterbox and other than a bit of tape to seal up the box it is free of polythene and plastic. Unfortunately multiple kits for the moment will need to include some plastic to not only keep kits separate, but to also send them securely, though we will keep plastic to a minimum. The gift bag does include some plastic in the window and lining, but is undyed and unbleached natural jute, so as eco as we can get for this type of bag. Whether you hang plants, a terrarium or just a bowl of treats it’s time to get knotting and this kit will get you started really quickly. It includes a metal ring (colour may vary from image), an illustrated pattern and enough cotton cord to create one good size hanger. 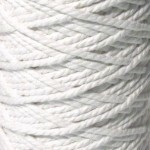 Don’t worry about scouring the internet for the right instructions and the right yarn – you get it all here for a great price, and once you’ve started you’ll be hooked,,,or should that be knotted? Finished size approx. 110cm in length (including 25cm of tassels). The pot shown in the photo measures approx 18cm in diameter and 17cm in height. Beginner. Very simple with just one knot repeated in different combinations throughout.